Lying 970 km (600 miles) west of the Ecuadorian coast on the equator, the Galapagos Islands consist of 6 main islands, 12 smaller islands and over 40 small islets. The Galapagos Islands are an archipelago of volcanic islands that originated about 10 million years ago. Since their formation 10 million years ago, to their discovery in 1535 by Thomas de Berlanga, the Spanish Bishop of Panama, the Galapagos Islands were completely isolated from the mainland. Throughout the millennia, a large number of birds, reptiles, insects, and plants drifted or flew to its shores, creating the unique flora and fauna found in the Galapagos today. The Islands have never been connected to a continent, therefore, over time, species have developed and adapted to the unique ecosystems of the Islands. Many species continued on and soon began to differentiate from their continental ancestors resulting in the development many endemic species (not found anywhere else) on the Islands. Until recently, the animals on the Islands had no exposure to humans and therefore never learned to fear them and remain extremely tame in human presence. At the culmination of his journey around the world with the HMS Beagle (1831-1836), the English scientist Charles Darwin, arrived at the Galapagos Islands in September 1835. The scientific findings he made during his stay at the Galapagos built the basis of his essay “Origin of Species by Means of Natural Selection” that completely changed the course of biological science. When you visit the Galapagos Islands you will quickly understand why the Spanish pirate Diego de Rivadeneira named the Islands “Las Islas Encantadas” (The enchanted islands). The Islands are filled with prehistoric looking land iguanas, 11 different species of giant tortoises, which give the Island their name (galapago means tortoise in Spanish), mocking birds pecking at your shoe laces, curious sea lions playing with you while you snorkel. There are 13 species of endemic finches (the famous Darwin’s finches), moon like landscapes and mist-covered volcanic peaks, red sand beaches, strange forests of prickly pear cactus, the world’s pinkest flamingoes (! ), the biggest breeding-colony of albatrosses in the world, blue-footed boobies performing their “sky pointing” dance, and hunting penguins swimming around your legs. These Islands are truly enchanting. The Galapagos Islands are famous for the rare species found on the islands. All the reptiles, half of the plants, and 40% of the birds are endemic to the Galapagos. • The Garua season goes from mid-June to mid-October (more or less): the cold current of Humboldt enters the island so the wáter is colder (around 20 degrees celcius, wetsuit is needed), cloudy days and a small drizzle. This actually makes the climate fresher so dont expect all sunny days but a cooler weather for the hiking , no need of A/C or fan during the night and almost no mosquitoes. The colder wáter brings more plancton and more wildlife, this is the best time of the year to spot whales during the boat transports. • The warm season is from November to Mid- May: days can be really hot (more than 30 degrees) and the wáter is warm due to Panama current entering in the islands marine reserve. No need for a wetsuit , sunny days, if you need to warm up from the Winter back home, this is the good season! Expect heavy tropical rains that can last 1 to 3 hours ( really, we have not that much days with rain all day long, it can happen but not on all islands at the same time). Due to the rains all the islands are greener. In between these two seasons would be the transition time where you can have a bit of both seasons! On the Galapagos you need casual clothes for high temperatures: shorts, t-shirts, swimming clothes, cap or hat. During the nights (especially in the cooler dry season) you may need long trousers and a thin jacket. Bring sandals or old tennis shoes because they may get wet during the so-called ,,wet landings”. Don’t forget to bring a prophylactic medicine against seasickness, a good suntan lotion, insect repellent, sunglasses and lots of memory card for your camera. Optional but very useful are binoculars and snorkeling gear (the last item also can be rented aboard). If you go on a dive trip, remember to bring your diving license! Below follows a list with some of the individual islands with their characteristics and landing sites and here you find Galapagos tour options. Given the name of the Holy Cross in Spanish, its English name derives from the British vessel HMS Indefatigable. It has an area of 986 square kilometers (381 sq mi) and a maximum altitude of 864 meters (2834 ft). Santa Cruz is the island that hosts the largest human population in the archipelago at the town of Puerto Ayora. The Charles Darwin Research Station and the headquarters of the Galápagos National Park Service are located here. Located on the north shore of Santa Cruz, Las Bachas is a swimming beach. One of the few remnants of the U.S. World War II presence in the Galápagos, a floating pier, can be seen here. You may see flamingos, Sally Lightfoot crabs, hermit crabs, black necked stilts, and whimbrels. Sea turtles also nest off the beach. Black Turtle Cove is located on the north side of the island and is only accessible by boat and with a guide. This shallow inlet is surrounded by mangroves and provides natural protection for a variety of marine life, attracting the vulnerable juveniles of many species. Below the surface of the water, you can see both blacktip and whitetip reef sharks, sea turtles, golden cownose rays, spotted eagle rays, and an occasional hammerhead shark. Pelicans and Boobies hunt here, diving gracefully into the water. The CDRS is an international not-for-profit organization that provides scientific research, technical information and assistance to ensure the proper preservation of the Galápagos Islands. Visitors can learn about natural history, issues concerning the islands, and see the tortoise breeding and rearing project at work. Carrion Point creates a sheltered lagoon with beautiful, turquoise water. During this visit you can snorkel and see a variety of fish, rays and perhaps the harmless white-tip reef sharks. The point is on the north coast of Santa Cruz Island at the entrance of Channel of Itabaca. The Dragon Hill (Cerro Dragon) visitors’ site was established by the Galápagos Islands National Park administration. A hypersalinic (saltier than the ocean) lagoon behind the beach is often frequented by flamingos, common stilts, pintail ducks and other species of birds. There is a short walk to the hill, which has rewarding views of the bay and a nesting site of land iguanas. El Chato is a reserve in the highlands of Santa Cruz, where you have the amazing opportunity to observe the magnificent giant tortoise in the wild. This area is vegetated with transition zone vegetation and is located in the humid zone of the highlands of Santa Cruz. The walk to the reserve is one of the best places to observe ground birds, tree and ground finches, the vermillion flycatcher, cattle egrets and occasionally Galápagos rails. El Garrapatero is a wide bay with multiple sandy beaches where you can enjoy turquoise water. Behind the beach is an area with a fresh water lake where you can see pink flamingos, herons, grebes, stilts, black-necked pins, Galápagos finches and migratory birds. It is also an excellent area for swimming. Gordon’s Rock is the most famous dive site in the central islands. Recommended for intermediate to advanced divers due to the strong currents and surges, Gordon Rocks offers an excellent opportunity to dive with hammerheads, tropical fish, the pelagic big fish, manta rays, marine tortoises, octopuses and moray eels. The highlands are located in the northern part of the island and can reach elevations up to 1500 meters. On a journey into the higher elevations of Santa Cruz you will experience all seven different vegetation zones. The vegetation here is abundant and lush and the weather moist. Los Gemelos, Spanish for The Twins, are two volcanic depressions on the highest part of Santa Cruz. The larger of the two volcanic pits is featured here. In contrast to the dry coastal lowlands, the highlands are covered by mist in the garua (foggy) season and receive thus much more moisture and support a more luxuriant vegetation. This is a 5km trail to a crescent-shaped hill called Media Luna, one of the large volcanic craters in the highlands of Santa Cruz Island. The trail first takes you to the agricultural zone near the National Park Boundary, the Miconia zone, and then leads to the Fern and Sedge zones that are typical of the highlands of the Islands. Birds that can be found there include the peregrine falcon and Galápagos rail. Puerto Ayora is the economic centre of the Galápagos Islands with many restaurants, souvenir shops, discotheques, bars, internet coffee shops and other stores. A good way to wind down after a Galápagos Islands cruise is to take a stroll through the town of Puerto Ayora. The bay is a good location to spot brown pelicans, golden rays, marine iguanas, herons, lava gulls, frigate birds, Galápagos sea lions, and large numbers of blue-footed boobies. Tortuga Bay is a pristine location with a beautiful white-sand beach. It is a great place for swimming and even surfing. Tortuga Bay is also a favorite place for sea turtles (which gave the beach its name), sea lions, marine iguanas, pelicans, flamingos and lava gulls which are endemic to the Islands and are commonly found along the shore of most beaches. The road going west out of Bellavista gives you access to some of the highland attractions. On this trail you will encounter the Tunel de Mirador, a lava tube extending more than one kilometre underground. You can explore the tunnel and learn the difference between stalagmites and stalactites. Whale Bay is the site of one of the oldest whaling camps on Santa Cruz Island. It was to here and the other similar camps that the giant tortoises were brought before being loaded onboard the whalers and pirate ships. The semicircle beach is green in color, due to a high volume of olivine crystals. The curious Galápagos hawk can also found here. The name is derived from Genoa, Italy where it is said Columbus was born. It has an area of 14 square kilometers (5.4 sq mi) and a maximum altitude of 76 meters (249 ft). This island is formed by the remaining edge of a large crater that is submerged. Its nickname of “the bird island” is clearly justified. An extraordinary, steep path leads through a seabird colony full of life, up to cliffs that are 25m high. At the top the trail continues inland, passing more seabird colonies in a thin palo santo forest. Leaving the forest you can overview a rocky plain. You could get a view of masked and red-footed boobies, great frigate birds, swallow-tailed gulls, red-billed tropicbirds and hundreds of storm petrels at the edge of the cliff. The beach is a coral beach where a 750m trail takes you through more seabird colonies. You get to see the cliffs from the seaward side, which are home to a large red-footed booby colony. Once ashore the number of birds seems overwhelming – Nazca boobies soar overhead, great frigatebirds display their pouches while resting on the nearby rocks and plants, and mockingbirds scamper quickly across the sand. Bartolomé Island is a volcanic islet just off the east coast of Santiago Island in the Galápagos Islands Group. It is one of the “younger” islands in the Galápagos archipelago. This island, and Sulivan Bay on Santiago island, are named after naturalist and life-long friend of Charles Darwin, Sir Bartholomew James Sulivan, who was a Lieutenant aboard HMS Beagle. The best known of Bartholomew’s features is the tuff cone known as Pinnacle Rock. This large black partially eroded lava formation was created when magma expelled from the volcano reached the sea. Arriving at the top of the wooden stairway you are treated to one of the great panoramic views in the Galápagos. The islands vary in colour from a bright orange, to blacks and greens. Sea turtles use the beach as a nesting site and can sometimes be found wading in the shallow water near the shore, or resting in the sand to recover from the arduous task of digging nests, laying eggs and covering them over. The beach offers excellent swimming and snorkelling opportunities. Galápagos penguins are frequently seen swimming in these waters. This island has an area of 585 square kilometers (226 sq mi) and a maximum altitude of 907 meters (2976 ft). Marine iguanas, sea lions, fur seals, land and sea turtles, flamingos, dolphins and sharks are found here. Pigs and goats, which were introduced by humans to the islands and have caused great harm to the endemic species, have been eradicated. The Sullivan Bay lava field has a variety of interesting patterns made by the shapes and textures of trees that once existed there and hornitos caused when pockets of gas or water trapped under the lava exploded. The low-lying mollugo and the lava cactus are the only plants that have managed to take root in this harsh environment. On the shoreline black and white oystercatchers can be seen fishing for crabs and molluscs in the tide pools. Buccaneer Cove is a testament to the fact that Santiago Island was once a refuge for British buccaneers. These pirates would anchor in the protected bay to make repairs and stock up on tortoise meat among other things. The steep cliffs, where hundreds of seabirds perch in front of the dark red sand beach, are a magnificent site. Cousin’s Rock is a wall dive recommended for advanced and expert divers. With strong currents it is a great site for seeing a forest of black juvenile corals, Galápagos seahorses, octopuses, hammerheads, Galápagos sharks, green sea Tortoises, eagle rays, schools of barracudas and a great variety of tropical fishes. This makes Cousins Rock one of the best places to dive. With a long blackened coastline where lava has eroded, there are many lava pools found here as well as caves and inlets that are home to an amazing variety of wildlife. You can spot marine iguanas here along with hundreds of Sally Lightfoot crabs and herons. In the inlets, Galápagos fur seals can be seen swimming with many species of tropical fish, sharks, moray eels and octopuses. There are also some wonderful snorkelling opportunities. This large coffee-coloured sand beach is just north of the prized fresh water supply that once attracted pirates and whalers. A short walk inland will take you through a mangrove forest normally inhabited by the common stilt. Sea turtles also visit these mangroves to nest. Beyond the mangroves is a brackish lagoon where flocks of pink flamingos and white-cheeked pintails can be seen. Sea turtles often lay their eggs on Espumilla Beach. Puerto Egas, with its black sand beaches, was the site of small salt mining industry in the 1960s. A hike inland to the salt crater is an excellent opportunity to sight land birds such as finches, doves, and hawks. A walk down the rugged shoreline will turn up many marine species. Iguanas bask on the rocks and sea lions laze in the tide pools. At the end of the trail there is a series of grottoes or sea caves where fur seals and night herons are found. South Plaza has one of the largest populations of land iguanas in the Galápagos. It is also home to marine iguanas and a hybrid iguana whose fathers are marine iguanas and mothers are land iguanas. There are cliffs with spectacular views and a rocky trail circumnavigates the island displaying the combination of dry and coastal vegetation zone. The island is home to enormous prickly pear cactus and the endemic succulent sesuvian. Santa Fe is a volcanic uplift and hosts a forest of Opuntia cactus, which are the largest of the archipelago, and palo santo. Weathered cliffs provide a haven for swallow-tailed gulls, red-billed tropic birds, and sehar-waters petrels. The Santa Fe species of land iguanas are often seen, as well as lava lizards. There is a picturesque turquoise lagoon and calm waters where you can snorkel amongst sea lions. This is the first island in the Galapagos Archipelago that Charles Darwin visited during his voyage on the Beagle. This islands hosts frigate birds, sea lions, giant tortoises, blue- and red-footed boobies, tropicbirds, marine iguanas, dolphins, swallow-tailed gulls. Its vegetation includes Calandrinia galapagos, Lecocarpus darwinii, and trees such as Lignum vitae.The largest fresh water lake in the archipelago, Laguna El Junco, is located in the highlands of San Cristóbal. On a small hill there is a wooden platform that offers amazing views of the tortoise rearing center La Galapaguera as well as the south and eastern coasts of the Island. It is home to unique plant life found only on San Cristobal: Calandrinia Galapagosa and Lecocarpus Darwinii. It is also possible to find San Cristobal mockingbirds and canaries here. One of the first sites visited by Charles Darwin, Cerro Brujo is a beautiful white-sand beach where brown pelicans, blue-footed boobies, sea lions, and marine iguanas can all be found. An onshore version of nearby Kicker Rocks, Cerro Brujo is a very striking, eroded tuff cone. There is also fantastic snorkelling in the turquoise waters. The Galápagos National Park Interpretation Centre has a series of interactive exhibits providing information about the history and biodiversity of the Galápagos Islands. The self-guided walking tour will take you through the history of the Islands in the context of nature, humankind and conservation. This small island is named after the sea lions that rest and play on its rocky shores. It is also home to blue-footed boobies, great frigate-birds, brown pelicans, lava gulls, common noddies, yellow warblers and small and medium ground finches. There is good snorkelling in the clear waters of the channel and this is one of the best sites at which to swim with sea lions underwater. This small, distinctive island comprises two rocks which jut out of the ocean and is home to a large colony of sea birds. Kicker Rock is an excellent dive site where you could see many reef fish as well as hammerhead and Galápagos sharks. Sightings of large rays and turtles are common but not guaranteed. At this information centre in the highlands you will learn about the giant tortoise breeding programme established by the National Park. You can see giant land tortoises living in a semi-natural habitat and also learn about their origin, evolution and the threats from introduced animals. Cerro Tijeretas is located 2km from the Interpretation Center, on the southwest of San Cristobal Island. It is named for the frigatebirds that make it their home and was one of the first places Charles Darwin landed. It is the ideal place to enjoy a spectacular view of white sand beaches on one side and the roofs of Puerto Baquerizo on the other. El Junco Lagoon, in a small crater which in turn is located within the large caldera of a volcano, is the only permanent freshwater lake in the Galápagos. From the top of the crater there are breathtaking views of the Lagoon and surrounding hills. It is frequented by dozens of frigates and you can normally also see Galápagos pintails, moorhens and pied-billed grebes. This relaxed town overlooking a harbour is the capital of the Galápagos Islands. You can visit the Natural History Museum as well as the Cathedral with its painted murals depicting Galápagos themes. The Natural History Museum is full of birds, iguanas, sea lions and dolphins as well as whalebones, tortoise shells, corals and crabs. The only living species in the museum is a tortoise called Pepe, who lives in an enclosure behind the main building. This small Island just an hour from San Cristobal Island is a subtle introduction to the Galápagos Islands. It is an easy wet landing with a short trail leading to a sand beach good for swimming. Pelicans and other sea birds fly overhead. There is a small tidal lagoon behind the beach where sea birds can be observed as well as the rare Chatham mockingbird. This is a great place for snorkelling. Here there are endemic species such as lava lizards and red-footed boobies. The view is impressive when you walk up to the high part of the island. You may be lucky to see the red footed booby, the least seen of the boobies. It is also the home of the Chatham mockingbird, only found on San Cristobal Island. Puerto Chino is a white sand beach reached by a hike over lava fields. Here you can see first hand the dry forest habitat particular to San Cristobal. At Puerto Chino Beach there are many opportunities for viewing some of the more well-known shore birds of the Islands including the blue-footed booby and the magnificent frigate bird. Española is the oldest island at around 3.5 million years and the southernmost in the chain. The island’s remote location has a large number of endemic fauna. Secluded from the other islands, wildlife on Española adapted to the island’s environment and natural resources. Marine iguanas on Española are the only ones that change color during breeding season. This is one of the most outstanding wildlife areas of the archipelago, with a long list of species found along its cliffs and sand or pebble beaches. In addition to five species of nesting seabirds there are the curious and bold Española Island mockingbirds, Galápagos doves and Galápagos hawks. Several types of reptiles, including the marine iguana and the oversized lava lizard, are unique to this island..
Gardner Bay has a magnificent beach with turquoise waters. Around the small islets nearby, snorkellers will find lots of fish and sometimes turtles and sharks. The bay is also frequented by a transient colony of sea lions which like to swim with you. Birds, like the endemic Hood-mockingbird and different species of Darwin finches, are omnipresent. This small island to the southeast of Española Island is a marine visit where you can enjoy fantastic snorkeling and swimming. It has an area of 173 square kilometers (67 sq mi) and a maximum elevation of 640 meters (2,100 ft). It is one of the islands with the most interesting human history and one of the earliest to be inhabited. Flamingos and green sea turtles nest (December to May) on this island. The “patapegada” or Galápagos Petrel is found here, a sea bird which spends most of its life away from land. This site shows a breath-taking view of La Lobería and the inland features of Floreana Island. You can also learn about the mysterious disappearance of Baroness Eloise Wehrborn de Wagner-Bosquet, an attractive young Austrian, who lived on Floreana with her two lovers. A small island located very near Floreana, snorkelling and diving around Champion can be excellent. Champion Rock is a beautiful drift dive on a wall. The walls are covered with black coral bushes and yellow cup corals and if you take a close look you are likely to find a Pacific seahorse or some of several species of hawkfish, as well as green turtles, salema and surgeonfish. Noted for the volcanic green olivine crystals found in the beach, Cormorant Point offers a trail overlooking a saltwater lagoon that is a favourite of flamingos. Beyond the lagoon the trail leads to a magnificent white-sand beach. Green sea turtles lay their eggs in the sands here during the night and their tracks leading to and from the sea mark the beach. A hill 450 m high that is behind Straw Hill in the agricultural area of the island. The main attractions are of an historic type: one is the cave of pirates and the other is the freshwater spring. The two sites are located at the base of the hill. Also a Scalesia pedunculata woodland exists, in good condition and Straw Hill is an area where the Galapagos Petrel nests. Arguably the best snorkelling site in the islands, Devil’s Crown is a collapsed volcanic cone that boasts an extraordinary number and variety of fishes. It is a popular roosting site for seabirds such as boobies, pelicans, and frigates. In addition, sharks, sea lions, sea turtles and eels can be found amongst the rocks and corals. The best known site on Floreana is Post Office Bay, a white-sand beach where in the past sailors used to leave and receive their letters in a barrel. The tradition continues – leave your postcard in the barrel and see how long it takes to be delivered, and at the same time if there is a postcard with an address close to your home, please take it with you. The small town of Puerto Velasco Ibarra lies on the northwest side of Floreana. Descendents of the Wittmer family, made famous by The Galapagos Affair, still own and run a recently renovated and expanded hotel in the town. From Puerto Velasco Ibarra you can visit Black Beach and look for the medium tree finch, found only in the humid zone on Floreana. A path 900 m long made up of rocks and sand. 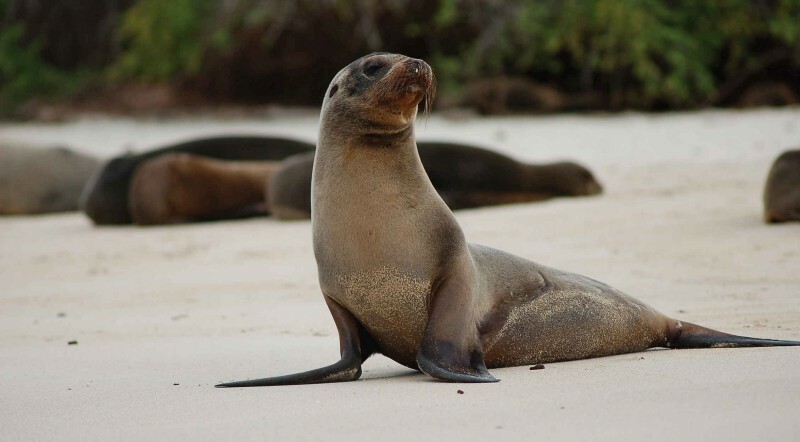 The main attraction of this site is the presence of Galapagos Sea Lions that are on the beach and in the bay. Marine iguanas are also seen along the shores and lots of sea turtles in the rocky reefs of the Bay. The practice of snorkeling and kayaking are the main ancillary activities that take place here. The 2km trail crosses the inland of the island and explores the rocky coast, passing colonies of blue-footed boobies and magnificent frigatebirds. Daphne Major and Minor can be spotted in the distance and body surfing sea lions play close to the shore. Along the shoreline marine iguanas, white coral and black lava rocks complete the visit to North Seymour. One of the least visited sites, Sombrero Chino (Chinese Hat) has special landscape worth the visit. The landing is on a beautiful crescent-shaped white-sand beach, home to sea lions and Sally Lightfoot crabs. The trail on Sombrero Chino explores its volcanic origin and offers some spectacular views of the waves crashing below. Snorkelling in the waters near Sombrero Chino you can see white-tipped sharks, Galápagos penguins and sea lions. The name was given in honor of King Ferdinand II of Aragon, who sponsored the voyage of Columbus. Fernandina has an area of 642 square kilometers (248 sq mi) and a maximum altitude of 1,494 meters (4,902 ft). This is the youngest and westernmost island. In May 13, 2005, a new very eruptive process began on this island when an ash and water vapor cloud rose to a height of 7 kilometers (23,000 ft) and lava flows descended the slopes of the volcano on the way to the sea. Punta Espinosa is a narrow stretch of land where hundreds of marine iguanas gather largely on black lava rocks. The famous flightless cormorant inhabits this island and Galápagos penguins, pelicans and sea lions are also abundant. Different types of lava flows can be compared and the mangrove forests can be observed. The island’s seahorse shape is the product of the merging of six large volcanoes into a single landmass. On this island Galápagos Penguins, Flightless Cormorants, Marine Iguanas, pelicans and Sally Lightfoot crabs abound. At the skirts and calderas of the volcanos of Isabela, Land Iguanas and Galápagos Tortoises can be observed, as well as Darwin Finches, Galápagos Hawks, Galápagos Doves and very interesting lowland vegetation. Los Tuneles Tour, also known as Cabo Rosa Tour, is a tour to a small group of uninhabited islets ad lava formations located about 1 hour from Puerto Villamil, Isabela Island. They belong to the most bio diverse sites in Galapagos and make a must-do day trip… The Los Tuneles lava formations look like tunnels and over hundreds of years have become a marine paradise inhabited by varied endemic Galapagos species. A tour to Cabo Rosa is ideal for snorkeling due to its crystal-clear and shallow waters. Usually this tour starts at Puerto Villamil on Isabela Island and makes (snorkel) stops at: Roca Union, Finados and Los Tuneles. You will also spend a short time on the small islands to admire its wildlife. Highlights: During a tour to Los Tuneles/ Cabo Rosa, you might be able to see as many species as the: Seahorses, Zayapas, trumpetfish, surgeon fish, manta rays, penguins, albatrosses, flamingos, Marine Iguanas, sea lions, blue-footed boobies, Nazca Boobies, royal frigate, Cactus finches, sea turtles, a variety of birds, lobsters, sea snakes, among other species. With some luck you might even be able to see eagle rays, golden rays and killer wales! Difficulty: Moderate, light hiking over lava rock. Dry landing: small zodiac boat to dock. Open water snorkeling from (speed)boat. At Isabela’s remote northern tip the remains of a US World War II radar base line the shore. The Point is the nesting site for flightless cormorants and home to a colony of the largest marine iguanas in the Islands. One of the most pristine visitor sites within the Galapagos National Park, here you can see a pahoehoe lava flow. Cape Marshall is a very special dive, where lava from the Wolf volcano falls into the ocean. This forms a steep slope with boulders and lava ridges. It is a good place for mantas. The maximum diving depth is around 1600m / 5249.3ft and is suitable for advanced divers. The average visibility is 10-20 meters. Reef, wall and drift dives are possible. Elizabeth Bay is a marine visitor site. As enter you the bay Galápagos hawks can soar overhear and schools of pompanos and dorados can be seen swimming underneath you. Las Marielas, the small islets just outside the bay, are home to the largest concentration of Galápagos penguins living in the Islands. You can also see a red mangrove cove, passing through the red root and green leaf breeding ground for fish. Here you can see beautiful rocky shores where penguins and shore birds, including great blue herons, are usually spotted. You can also enter a grove of mangroves, where oysters can be seen at the base of the trees. A trek traverses the sharpest lava rocks in the Islands where dry lava is interspersed with lagoons and small ponds containing abundant wildlife. Puerto Villamil is a small peaceful town with a laid back atmosphere and long white-sand, palm-lined beaches. Behind Villamil are several brackish water lagoons where pink flamingos, common stilts, whimbrels, white-cheeked pintails, gallinules are usually seen. Villamil is also home to a tortoise breeding centre. Here you can see several species of Isabela tortoises next to each other and observe the way each evolved differently depending on their environment. A short distance from Puerto Villamil is the small island known as Las Tintoreras. Here a colony of white tip sharks can often be seen resting in a lava canal. You can snorkel or swim in the unique habitat of these animals. On the nearby sandy beaches, sea lions play and relax in the sun. This is one of Isabela’s most beautiful visitor sites. Sierra Negra is a large shield volcano at the South eastern end of Isabela Island. It is the habitat for the Sierra Negra giant tortoise, which has a saddleback shell. On the way up to Sierra Negra you can see tall trees and lush highland vegetation and the summit offers a spectacular view of the lowlands. Named after a British warship which anchored here in 1814, this cove is located to the west of the island and you can take a panga (zodiac) trip below the high cliffs. Here there is an opportunity to see penguins as well as marine iguanas, Sally Lightfoot crabs and sea lions. Blue-footed boobies are also in abundance. This center was created to protect animals in their first years of life from the threats of foreign species such as pigs and donkeys. Giant tortoise eggs are collected and brought to the center where they are hatched and kept for five years before being released to their natural environment. Highlights: Two of the five sub-species of the giant tortoise. The waters of Urbina Bay are a good place to see turtles and rays and ashore is a short trail leading to a coral reef, which is evidence of an uplift from the sea which occurred in 1954. This provides the rare experience of walking in the middle of a bed of coral. Marine iguanas, flightless cormorants and pelicans can be seen at this site. Here the remnants of an ancient volcano form two turquoise coves with a bay well protected from the ocean swells. The spot is a popular anchorage from which to explore the cliffs, where masked and blue-footed boobies perch while flightless cormorants inhabit the shoreline. The upwelling of coldwater currents in this part of the Galápagos give rise to an abundance of marine life, which make Punta Vicente Roca one of the archipelago’s sough after dive spots. Between 1946 and 1959 Isabela was a penal colony, where prisoners were made build a wall with huge blocks of lava as punishment. Due to the arduous labour and harsh conditions in which the prisoners lived, this site is known as the wall of tears. A set of stairs provides a bird’s eye view of the wall and the surrounding landscape. You can still see the foundations of a USA base from the Second World War. The Wetlands of Isabela Island are located just outside of Puerto Villamil. The Wetlands consist of lagoons, swamps and mangroves and are home to a variety of unique bird species such as common stilts, whimbrels, white-cheeked pintails and gallinules. The Wetlands can be visited on foot via a path that winds through the swamps. The high amount of iron contained in the lava at Rábida gives it a distinctive red color. White-Cheeked Pintail Ducks live in a salt-water lagoon close to the beach, where brown pelicans and boobies have built their nests. Up until recently, flamingos were also found in the salt-water lagoon, but they have since moved on to other islands, likely due to a lack of food on Rábida. Nine species of Finches have been reported in this island. Rabida has a distinctive look, with its reddish beach, cliffs, and steep slopes of volcanic cinders. A noisy colony of sea lions lives on the beach, and a short trail inland is a good place to observe land birds such as finches, doves, yellow warblers, and mockingbirds. Hidden behind a narrow strip of green salt bush is a briny lagoon where flamingos may be found. Snorkelling along the rocks at the east end of the beach may reveal many of the reef fish common to these waters. Located between North Seymour and Baltra is the small island of Mosquera. The island consists is a long narrow stretch of white sand, rocks, and tide pools. Created by geological uplift the island has a flat look to it rather than the conical shape of the volcanically formed islands. Mosquera is a great place for visitors to wander without the typical restrictions of the other islands. It is ideal for snorkeling, strolling on the beach, and enjoying the animal life. Named after Fray Antonio Marchena. Has an area of 130 square kilometers (50 sq mi) and a maximum altitude of 343 meters (1,125 ft). Galápagos hawks and sea lions inhabit this island, and it is home to the Marchena Lava Lizard, an endemic animal. There are no official visitor sites on Marchena Island but there is some excellent diving and snorkeling at Punta Mejía. It is a sensational site with calm deep blue waters and a rugged marine topography, with plenty of shelter for an abundant variety of fishes, rays, and sea turtles. Playa Negra offers another excellent opportunity to snorkel or kayak, this time around a recently formed lava grotto where it’s possible to capture images of marine iguanas diving for algae growing on the submerged lava beds. Around Playa Negra you may see bottle nosed dolphins, other cetaceans or feeding frenzies. The National Park service restricts visitors allowed to visit Daphne and it is a select few that are able to visit this special place. Visitors venture up a steep trail to the crater rim. Finches, masked boobies, short-eared owls and Galapagos martins are visible along the way. Red-billed tropicbirds nest in the cliffs near the summit. Magnificent frigatebirds build their nests in the little vegetation that occurs on the Island’s slopes and near the crater rim. With a number of protected anchorages, a variety of dive sites and drift dives with large animals it is no wonder this area has topped the list of favorite sites. Due to the warmer waters here you will find many fish found nowhere else. Large pelagic fish like whale sharks, Galápagos sharks, black-blotched stingrays, spotted eagle rays have also been seen here. Hammerheads swim in a never ending parade across the reef. Because this island is the furthest north of the Galapagos Islands, the Humboldt Current has little effect here and the waters are warmer than in the south; as such there are more corals here than the other Islands. The quality can be overwhelming. Darwin’s Arch sits just above the surface on an underwater plateau and the steep barnacle covered walls drop off to the deeper ocean. The water it is thick with hammerheads and on the ridge side there are large schools of fish.